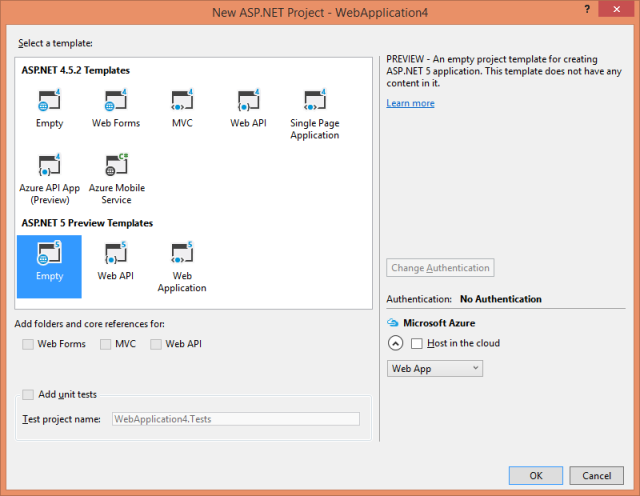 This article is now updated for ASP.NET 5 RC 1. Also read Part 2 and Part 3. So, make sure you have them installed correctly before you proceed any further. 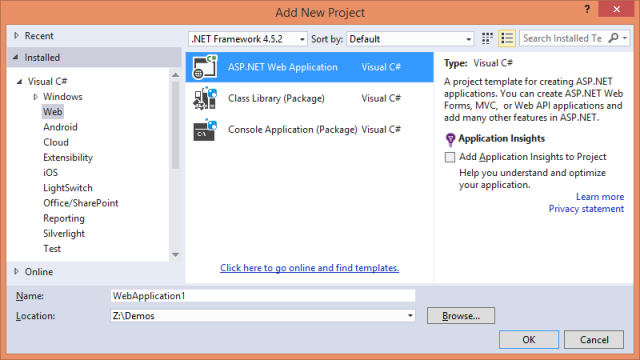 Open Visual Studio 2015 and select File > New > Project menu option. 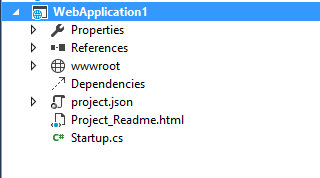 In the New Project dialog select ASP.NET Web Application, give some project name and click OK button. Right click on the References node and select Manage NuGet Packages. This is quite similar to MVC 5.x projects. Once added the NuGet package entries are automatically added to the Project.json file. Add NuGet package dependencies directly in the Project.json file. Next, right click on the project and select Add > New Item to open the Add New Item dialog. 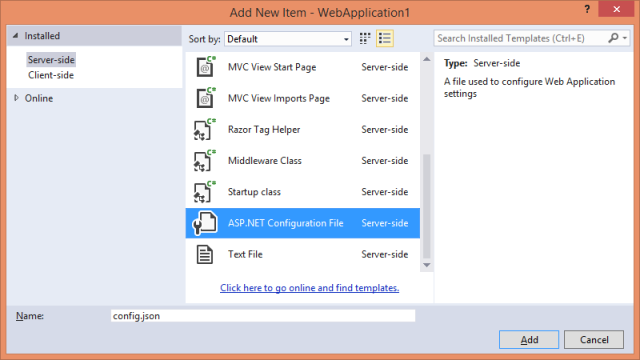 Select ASP.NET Configuration File from the list, name it AppSettings.json and click on Add to add the file to project root folder. The AppSettings.json file contains all the application specific configuration (no more web.config). Remember the difference between Project.json and AppSettings.json. The former file stores project configuration that is necessary to compile and run the project. The later stores application configuration utilized in the code (connection strings, application settings and so on). As you might have guessed, we stored database connection string for the Northwind database under Data:DefaultConnection:ConnectionString key. Now add four folders under the project root namely Models, Views, Controllers and Classes. The purpose of the first three folders is quite obvious. The Classes folder will be used for storing other classes needed in the application such as a DbContext class. You are free to give any other name to this folder (or you may even isolate them in a Class Library). The AppSettings class contains a single static property - ConnectionString - that is intended to hold the database connection string. This property is assigned from the Startup class as discussed shortly. Once assigned you can access the database connection string from anywhere in the application. Now open Startup.cs file. The code from the Startup class is invoked whenever the application runs. You will find that the Startup class consists of two methods - ConfigureServices() and Configure(). Both of them have special meaning to the framework and hence their name must be kept unchanged. Modify the Startup file to include a few namespaces and a public constructor. Notice the namespaces at the top. They are required by the code that you will fill in these methods shortly. Also notice that the constructor accepts two parameters - IHostingEnvironment and IApplicationEnvironment. These three methods are executed by the framework in the same order - Startup(), ConfigureServices() and Configure(). Next, add the following code to the Startup() constructor. The Startup constructor basically reads the AppSettings.json file and stores the database connection string into the AppSettings class. The ConfigurationBuilder class is responsible for reading and loading the configuration information. The SetBasePath() method sets the base path where the configuration file(s) is located. The ApplicationBasePath means the physical path of the project's root folder. The AddJsonFile() adds AppSettings.json file to the list of configuration files to be processed. You can have multiple configuration files per project. The Build() method reads the configuration and returns it as an instance of IConfigurationRoot. To read the configuration settings, you can use Get<T>() method on the IConfigurationRoot object. Notice how the setting to be read is specified using the : notation. Now the database connection string can be accessed from anywhere in the application in typed manner (and without reloading the config files). The ConfigureServices() method specifies the features that are available to your application. In this case your application is made available the services of the MVC framework and the Entity Framework. The Configure() method tells the framework that you want to use static files feature and MVC features. The static files feature allows you to access static files such as .htm and .html. If you don't specify this feature and attempt to access the static files you will get an error. Of course, if you don't need this feature you can skip this line. The UseMvc() call is important because it not only tells the framework that your application is using MVC but also configures the routing system. Notice that the Index() action returns IActionResult. The Index() action is quite straightforward and simply sets Message property on the ViewBag. Then add Home subfolder under Views folder. Right click on the Home folder and open the Add New Item dialog again to add Index view to the project. Add the following HTML markup to the Index view. The Index view simply outputs the Message ViewBag property on the response stream. Although our application is working as expected we didn't use AppSettings class and Entity Framework features. The second part of this article discusses those details. Till then keep coding!